Pandemic: Fall of Rome, a reprint of Ankh-Morpork, Horizon Zero Dawn gets a board game, Everdell expansion, and more in this week’s News Brief. Raise armies, defend your cities, and forge alliances to ward off relentless barbarian incursions reads the start of the press release. Curing disease this isn’t, unless the disease is THE REPUBLIC ITSELF. 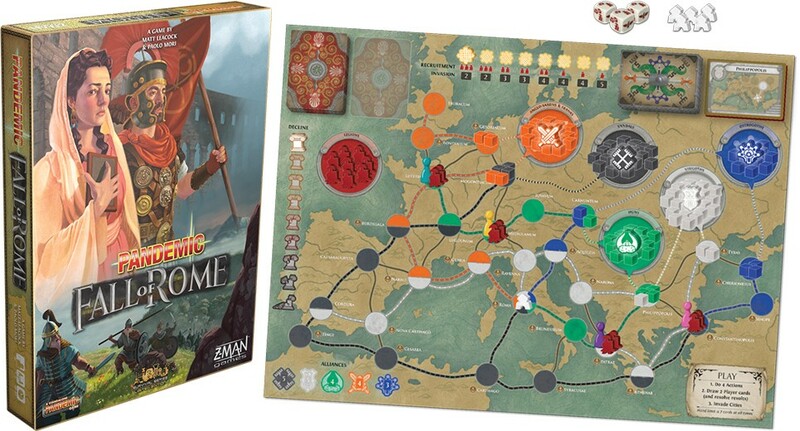 Players must defend against outside threats, avoid revolts, and prevent enemies from reaching Rome itself using the standard Pandemic mechanisms. 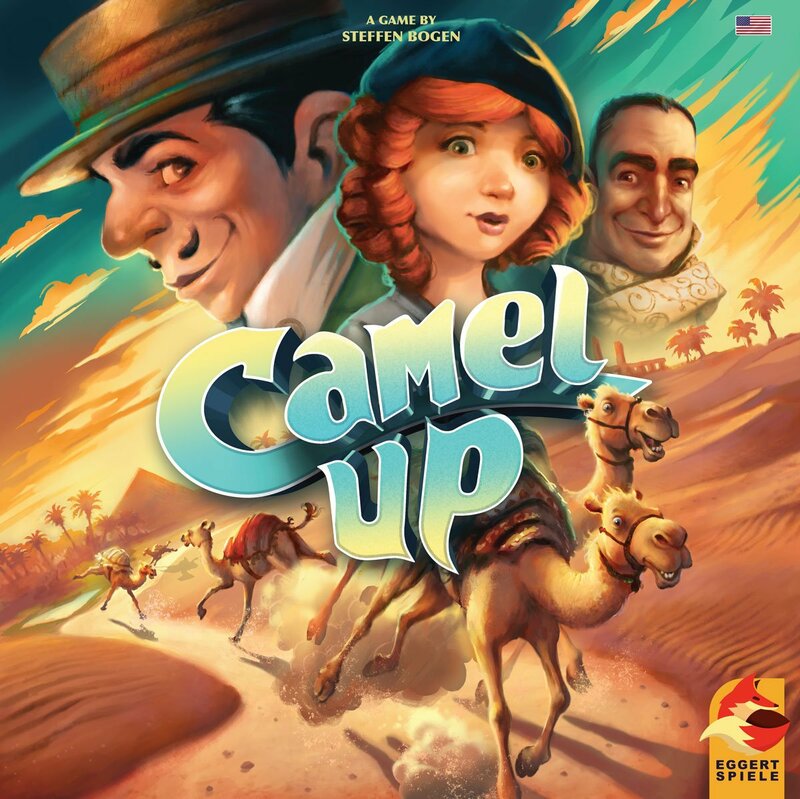 Pop-up palm trees, camels that run backwards, and camels that won’t race – all’s fair in love and camel racing! The new edition features art from Chris Quilliams (Azul, Archipelago, Arboretum) and will be available soon – if you prefer the old art, you might want to head over and pick that up. Each hunter has a distinct playstyle with a unique set of strengths and weaknesses. Hunters can sneak through tall grass and remain hidden until the time to strike is right, but every second which passes means the machines are one step further along their patrol routes. Hunters earn glory points during each encounter for performing particularly heroic or devastating attacks; but if one hunter dies, then it’s game over for everyone. Horizon Zero Dawn is on Kickstarter now. Nanty Narking is a straight reprint of Ankh-Morpork, the Discworld board game by Martin Wallace. Long out of print, the game comes back as a Victorian London theme with all the area control, player powers, and card play of the original. I love this game and can vouch for the quality of its gameplay. The VERY gorgeous Artemis Project is about building a colony on Europa, one of the moons of Jupiter, with the illustrator of Transatlantic taking us to the far reaches of the outer solar system. Blending dice placement, resource management, and engine building, compete to build the best colony. Pearlbrook: an Everdell expansion adds a delightful underwater component to the charming and incredibly thinky worker placement/tableau builder. I personally can’t wait for this, Everdell is one of the best games of the year and this one adds playable axolotls and platypuses, two of my favorite animals! Thanks for reading the News Brief! Have you read our picks for the 6 Best Board Games that came out at Gen Con? And watch out for our Road to Essen coverage releasing soon!